A smart portfolio can mean the difference between a comfortable life and a constant struggle. Most people make poor, emotionally based investment decisions with many biases. Even investing professionals who studied Modern Portfolio Theory did not help their clients in the Global Financial Crisis. In fact, when I ask professional investment advisors if they would hire themselves if they had $100 million in the bank, they all say of course not. Most pundits, from celebrity investment gurus to leading academics, have simply been wrong about markets and their predictability. We are entering a new era of machine trading, where the average person has no chance to systematically outperform the markets. 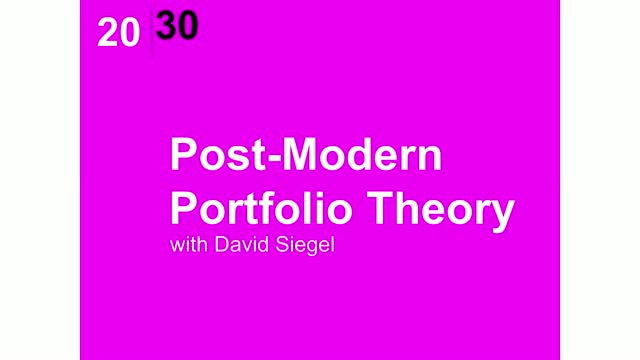 Learn about post-modern portfolio theory with David Siegel and start building a smart portfolio today.